Riaan de Villiers is a former journalist who currently works as an editor and contract publisher. © Copyright Riaan de Villiers. This article may be quoted, replicated, stored, and transmitted, but the source must be fully and appropriately acknowledged. IT’S TUESDAY evening, 21 February 2018. I am looking at an online photograph of Cyril Ramaphosa and Jacob Zuma, smiling from ear to ear (like crocodiles, actually) and cordially shaking hands. Ramaphosa is gripping Zuma’s arm above the elbow. There are Cape Dutch antiques in the background, confirming that the photographs have been taken in Tuynhuys, the presidential residence in Cape Town next to the Houses of Parliament, and not at some other venue weeks or months before. Image credit Government of South Africa via Flickr. 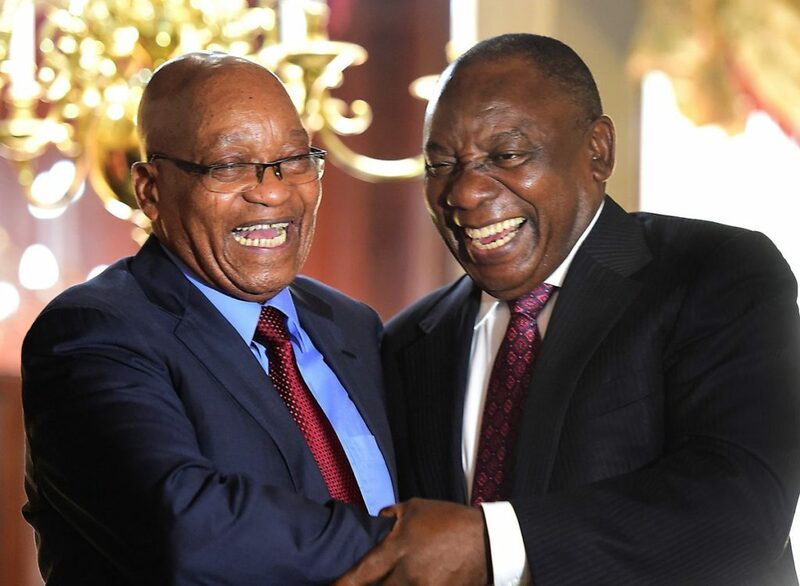 The accompanying report on the News24 website is headlined ‘Zuma, Ramaphosa share a good laugh during farewell party’. It goes on to say that President Cyril Ramaphosa hosted a farewell function for his predecessor, Jacob Zuma, at Tuynhuys that afternoon. According to the Presidency, the farewell – attended by various ministers, deputy ministers and Presidency officials – was aimed at paying tribute to Zuma ‘for his contribution to South Africa’s development during his nine years in office’. The story and pictures seem to confirm a return to happy stability after an uncomfortable political period. Things were rough for a while, the event and pictures seem to say, but the dust has settled; we have a new president, who has been jogging in public and has introduced an entirely new era in South African politics, marked by conciliation and the negotiated settlement of conflicting interests. Throughout what the ANC has disarmingly called the ‘presidential transition’, Ramaphosa had insisted on a dignified exist for Zuma. The Tuynhuys event seems to vindicate this strategy, which appears to have succeeded beyond the highest expectations. Let bygones be bygones, the picture seem to say; let’s put the events of the previous weeks behind us, and work together on South Africa’s new dawn. It’s like the All Blacks and the Springboks sharing a beer after a bruising rugby test. Another report on the same website even states that Zuma is expected to campaign for the ANC ‘among the people’ prior to the 2019 general elections. South Africa has just emerged, shell-shocked, from one of the most tumultuous periods in its post-apartheid political history. It has been refracted in a blizzard of media coverage, in the newspapers, online news sites, television newscasts, and the social media. Nevertheless, there are curious moments in this stream of events that are still unexplained, and the chances of them being explained appear to be fading. Moment number one: It’s Fateful Wednesday, 14 February, The media, the ANC, and the country are awaiting Zuma’s response to the ANC NEC’s ultimatum to resign, or face a motion of no confidence in parliament the next morning. Zuma is understood to be closeted with confidantes, advisors and others. A presidential media briefing is scheduled for 10 am at the Union Buildings, but is cancelled. Later in the day, Zuma hauls in a single journalist, the SABC’s Mzwandile Mbetshe, for an ‘interview’ which is televised live at 2 pm. It continues for some 50 minutes, but the interviewer asks only two questions. Effectively, it’s a monologue by Zuma in which he seeks to explain why he is refusing to resign. As is well known, the main themes are that nobody has told him, Zuma, what he has done wrong, and that the ANC NEC can’t just up and go and recall a serving South African president. Near the end, he seems to hint at unspecified consequences if they persisted in trying to dislodge him in this way, which could be said to constitute a hidden threat. Analysts speculate briefly about what this could mean, but quickly jump back into the fast-moving stream of the day’s events. Moment number two: The Presidency announces that Zuma will address the media at the Union Buildings at 10 pm. It’s an odd time, and the notice is strangely worded, unlike a regular notice issued by the right people in a healthy constitutional democracy. Moment number three: The media briefing comes off. Zuma reads a statement which turns out to be an announcement of his resignation. The entire statement rapidly appears in the media. It is curiously disjointed, as if different bits were written at different times when different outcomes were envisaged, and they were never fully reconciled. Journalists briefly comment on this (among others on Twitter as the statement is being read at the Union Buildings), but again, in the vertiginous course of events following the statement, it is not fully explained. Journalists joke on Twitter than Zuma’s speechwriters might simply have lost interest, and fallen asleep in the course of a long day. Ramaphosa is sworn in as president, Mmusi Maimane leader of the official opposition, hugs Ramaphosa, and its chief whip, John Steenhuisen, gives him a cigar. CR jogs on the Sea Point beachfront, and delivers a hastily arranged SONA, witnessed by FW de Klerk and Thabo Mbeki, during which he declares famously that South Africa has entered a ‘new dawn’. There is a mood of jubilation at parliament about South Africa’s return to political sanity. Mandela’s legacy is repeatedly invoked. Moment number four: On Sunday, four days after Fateful Wednesday, the newly minted president addresses an interfaith service in Kimberley as the new Commander in Chief of the South African National Defence Force (SANDF). The event is said to form part of a build-up to the official commemoration of Armed Forces Day scheduled for the coming Thursday. Extracts from Ramaphosa’s speech is the lead item on several national TV newscasts broadcast that evening. He seems to be thanking the SANF for not meddling in the presidential transition. His appearance and remarks are freighted with some hidden meaning, but despite their prominent presentation on the news, this is not explained or explored. Meanwhile, earlier on Sunday, a remarkable report appears on the Media24 website which begins to connect the dots between these puzzling moments. Written by Setumo Stone and S’Thembile Cele, it is drawn from City Press, which is rapidly becoming the most informative newspaper in the country. Headlined ‘Isolated Zuma fought until the last moments’, if goes on to state that, on Fateful Wednesday, it took ‘hours of persuasion from lawyers, family members and senior ANC leaders to persuade JZ that his time was up and he had to vacate office’. For most of the day, indications were that Zuma was ‘prepared to go to the brink’. Luthuli House (the ANC headquarters in Johannesburg) was ‘on the alert’. Each word of his interview with the SABC was scrutinised to ‘try to anticipate his next move’. A comment in the course of the interview that he used to deploy solders was seen as a subtle hint ‘he was not a civilian and was in fact a commander in chief, albeit of a guerrilla army, and that his forces were at the ready to defend him’. As the day progressed, however, it became clear that nothing could save Zuma, bar a public protest in his defence. ‘If any protest action had begun, he could have declared a state of emergency,’ a source is quoted to have said. Hold on there for a minute. State of emergency? Mentioned once, and in paragraph nine? To the best of my knowledge, the term ‘state of emergency’ has not appeared in any other media report, either on that day or since. Soon afterwards, I am told that Zuma did in fact consider declaring a state of emergency. I am also told that he considered having parliament cordoned off by the army. This would have made sense in that it would have prevented the motion of no confidence from being tabled the next morning. For that reason, it would presumably have happened just before or while he was speaking to the media. I am further told that Zuma also considered ordering the arrest of Ramaphosa and his cohorts on the grounds that they had ‘conspired to unseat the President of the Republic, and overthrow the South African state’. His plans for a state of emergency were supported by some highly placed officers in the SANDF. However, others refused, on the grounds that the constitutional conditions for declaring an emergency did not exist. Until the last moment, I am told, the ANC NEC and caucus were far more divided about Zuma’s recall than the public was led to believe. A large number of cabinet ministers had been among those around Zuma on Fateful Wednesday, and many of them were still prepared to follow where he intended to lead. Others were phoning Ramaphosa and his team to tell them what was happening. Lastly, I am told that Zuma’s campaign against the transition — including mobilising ethnically rooted protests — unfolded in secret over several months, and he had made extensive use of the intelligence services in the process. Armed with all this information, and suitably alarmed, I begin to examine some of those enigmatic moments in greater detail. Zuma’s entire ‘conversation’ with Mzwandile Mbetshe is available on the internet. When I listen to it more closely, I discover it is far less rambling and disjointed than it was subsequently made out to be. On the contrary, Zuma walks Mbetshe through a sequence of events and arguments with considerable precision. No one has told him concretely what it is that he has done wrong, which is ‘unfair’, and goes against ANC tradition. While the NEC as sought to recall him as a cadre of the ANC, it does not have the power to do so. Given that he had been elected as ANC president by an elective conference, this is the only body that could vote to recall him in turn. This could not be properly done by the Top Six, the working committee, or the NEC. As a result, he is not prepared to resign. He is not defying the leadership of the ANC, but simply does not agree with its decision. This is why he developed the proposal that he should agree to resign, but should only hand over power in about three months’ time, which will give him time to introduce the new president to African and BRICS leaders, among others..
At some point in a detailed chronological version of the negations between himself and various deputations, he begins to refer to a video clip someone showed him of ANC factions clashing outside Luthuli House in Johannesburg. He was shocked, he says, to see one comrade kicking another who was lying on the ground. This was cause for serious concern, because it seemed violence was likely between ANC members. At some point, he told the ANC president (Ramaphosa) the clip ‘worried him a great deal’. At this point, he may well be presenting Mbetshe (and the nation) with his proto-rationale for declaring a state of emergency. I also find the passage where he speaks about deploying soldiers, which — according to City Press — particularly alarmed Luthuli House. Slightly smoothed out, what he said was this: ‘You can’t enforce a decision as it has been done now onto another leader. In the process of my discussions with the President and the SG, when they were saying the ANC had the right and authority to deploy and remove, I said I totally agree. I’ve been there. I did this at times; I deployed soldiers to fight inside the country. Deploying cadres is what I know best. The media missed this too. Next, I look at the full text of Zuma’s resignation statement, delivered that evening at the Union Buildings. This really is disjointed, as if different bits were written at different times, and not put together in quite the right order. Lastly, I turn to the issue of what exactly Ramaphosa said in in his first appearance as president in that church in Kimberley. Helpfully, there’s a full video of the entire ceremony on the SABC YouTube channel, despite only a short clip being used for the national newscasts. Turning to General Solly Shoke, head of the SANDF, he continues: ‘And we are very pleased, General Shoke, that this Defence Force that you lead has remained committed to that task. I was extremely pleased just last week when I met on a one-to-one basis with General Shoke, and he assured me that this SANDF will never get involved in politics. This SANDF is there to protect the people of South Africa whoever the Commander in Chief is of our country. This prompts the immediate and obvious questions: when exactly did Ramaphosa have these one-on-one conversations with the head of the Defence Force and the Minister of Defence? And why? Since then, the waters have closed over Fateful Wednesday and these enigmatic moments as if they never happened. The public narrative has subsided into a comfort zone of convention and triviality. South African politics, it seems to say, have returned to reassuring sanity after an admittedly uncomfortable and essentially embarrassing period, which we have now put behind us. The SONA debate goes off in a haze of goodwill, and Ramaphosa continues to jog in public. As I finish writing this, we’re waiting for a cabinet reshuffle after extensive discussions and consultations, all presented as evidence of renewed good governance in a healthy democracy. My apologies for spoiling the party, but we need a bit of a reality check here. It could be argued that the threat of a state of emergency could be overplayed, as Zuma’s power was ebbing rapidly, and there were various dynamics in play that would have prevented this scenario from being played out in reality. Among other things, as those City Press writers noted, no public protests materialised in his favour, which would have provided him with his proposed raison d’etre for a state of emergency. But I think this is a fallacious and ultimately dangerous argument. At that point, as the City Press report correctly pointed out, Zuma still wielded ‘enormous power’. Most pertinently, he was still Commander-in-Chief of the SANDF. If he had insisted on declaring a state of emergency, who would have stopped him? Would he have been restrained in some way? And if he had made the announcement, what could anyone have done to reverse it? A chain of events would have been set in motion which would have been very difficult to arrest or reverse. The scales of power would have tilted back, and remained there for an indeterminate period. South Africa would have entered a new and strange political landscape, with no known way of getting back. Legislatures – albeit racial ones – have operated uninterruptedly since Union in 1910, as did the various colonies for many years previously. Even the Boer Republics had them. Not even PW Botha, during two states of emergency in the 1980s, came close to sealing off parliament. It could also be argued that it might be best to draw a veil of silence over these events – at least for a while – to allow Ramaphosa to consolidate his hold on power, and mitigate the set of dynamics and conditions that had brought South Africa to the edge of this particular precipice. Again, I don’t agree. Given half a chance, I suspect even our current political leaders might just allow the waters to close over all of this forever. A number of urgent and rather troubling issues emerge from this desanitised picture of ‘the presidential transition’. I will concentrate on three. The first concerns the South African media, which are free, vigorous, and have played a major and admirable role in exposing the state capture project under the Zuma presidency. Why has this deeper level of events not been exposed more systematically? It’s as if working journalists don’t have the vocabulary to talk about these sorts of processes in South African politics. They should develop one quite urgently. Second, and flowing from the first, despite the presence of many hugely talented African journalists in the mainstream media, who rise to high positions, there is still a disconnect between a ‘colonial’ and a largely submerged ‘indigenous’ political discourse, morphing into ‘outsider’ and ‘insider’ reporting. I use these crude terms deliberately in order to make this point. Of course, this is not confined to the media alone, but symptomatic of the gulf between the colonial and indigenous worlds that continues to bifurcate South African society. We should obviously continue to work at bridging it. The third concerns the ANC. South Africa has a constitution which entrenches a multiparty, constitutional and rules-based democracy, and which every citizen and organisation in the country are obliged to uphold. This includes the ANC, which played a major role in the constitutional negotiations, and voted unanimously for the constitution in its final form in 1996. On a different level, the previous regime handed political power to the ANC in at least a degree of good faith. Moreover, from 1990 onwards, the international community poured massive (and still largely unheralded) resources into South Africa in an attempt to ease the transition and help the country to establish a non-racial democracy. One hardly needs to state that declaring a state of emergency on these sorts of grounds and suspending parliament a mere 25 years later was not meant to be on the agenda. By their very nature, political movements are fluid and in some ways elusive organisations, which are constantly shaped and reshaped by their leaders and by electoral support, and therefore don’t easily lend themselves to any kind of stable institutional accountability (beyond, of course, the frustratingly slow mechanism of the ballot box which, let’s face it, can be as imperfect as the workings of the market). However, there is a sense in which the ANC as a whole can be said to have comprehensively betrayed the trust placed in it by a wide range of role players, let alone South African citizens. Given all this, I believe it has an obligation to the South African public and indeed a broader community of interest first to confirm whether this is what happened; and if it is, then to explain how and why it came to elect a president who came within a hair’s breadth of turning South Africa into a military-style dictatorship simply because he did not feel like stepping down, and what it is going to do to prevent this from happening in the future. However uncomfortable this might be in the short term, I believe this will be in the longer-term interests of the country as well as the ANC. Put simply, if this is what went down (and the evidence is compelling), the ANC should come clean, and we – ultimately all of us, collectively – should look this beast straight in the eye. In the meantime, will somebody please give each of those guys in the SANDF (including lower-ranking generals, apparently) a beeeg bloody Bells. I have submitted a series of questions arising from this article to former President Jacob Zuma, but have not yet received an acknowledgement or response. I have also submitted a set of questions to the President, Cyril Ramaphosa. I will publish and analyse their responses as soon as I receive them. I am, however, placing this article in the public domain in the interim, as I believe it is in the public interest to do so. UPDATE ON FRIDAY MORNING 2 MARCH: I sent my questions to the President early on Wednesday morning 28 February, using an email address supplied to me by telephone. This morning, they bounced back. When I phoned the Presidency, I was informed that their email system had been down for several days, but this was still the only way to file the questions. Attempts to reach the President’s media spokesperson on his celphone have been unsuccessful.